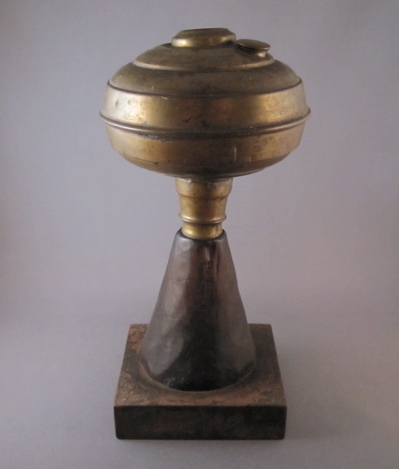 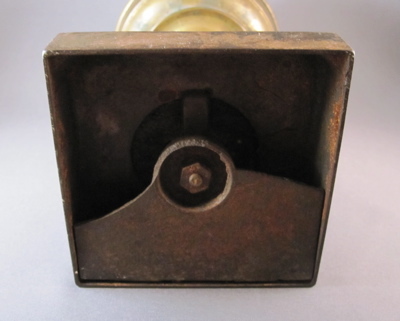 This small kerosene oil lamp has a brass reservoir joined to a square metal base using a hand carved wood conical stem. 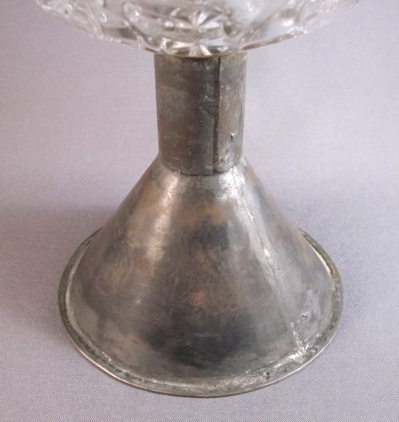 I found it in a small New England antiques shop a few years ago and although it is unmarked, I believe it to be American. 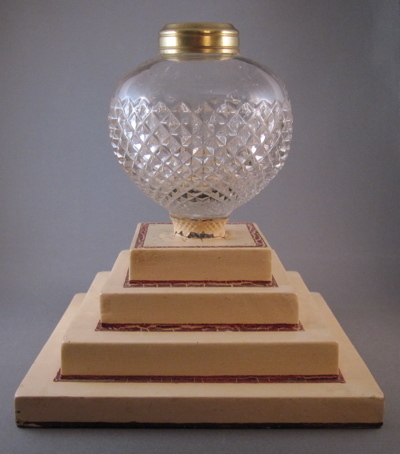 It stands 8.75 inches tall and the base measures nearly 4 inches square. 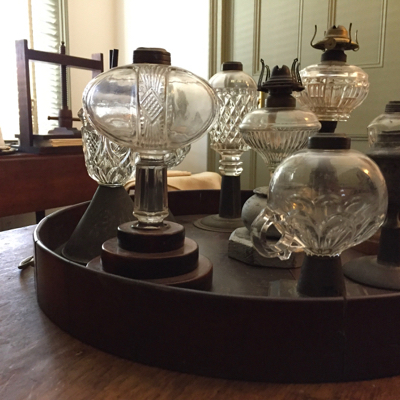 Lamps such as this were commonly used worldwide, from the mid 1800s through the mid 1900s. 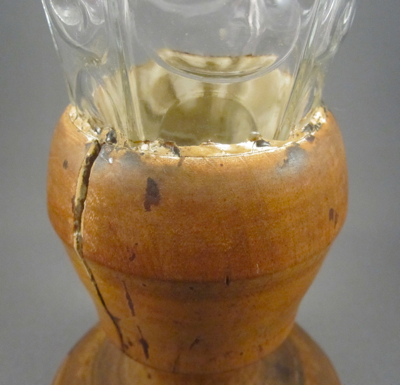 They were sturdy and made to last so I am puzzled by what caused this one to become unhinged. 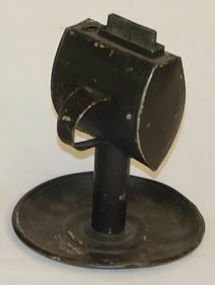 The replacement stem appears to be a home made job, and although practical, it is less than elegant. 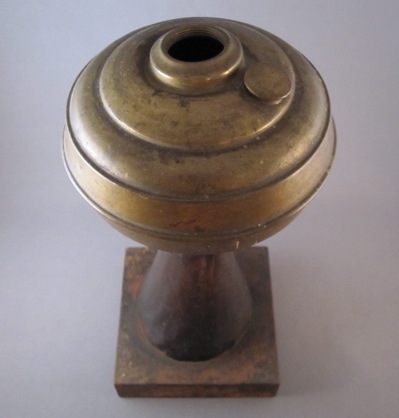 This brass oil lamp with similar form has all of its parts and shows what the original base on mine might have looked like. 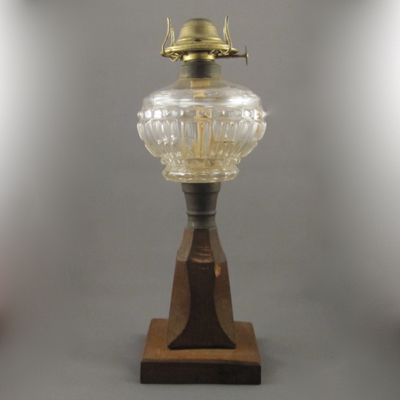 This American pressed glass oil lamp, dating from the late 1800s, can be seen in the exhibit Make-Do’s: Curiously Repaired Antiques at Boscobel House and Gardens in Garrison, New York, on view through October 1. 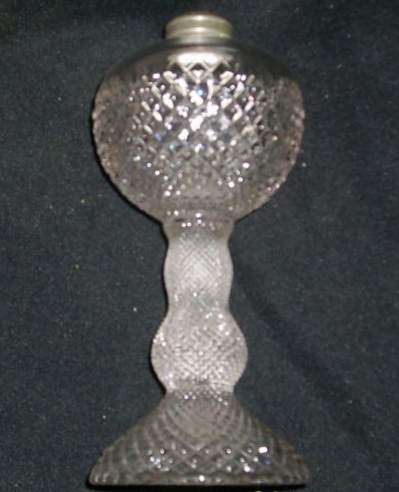 It measures 10 inches high. 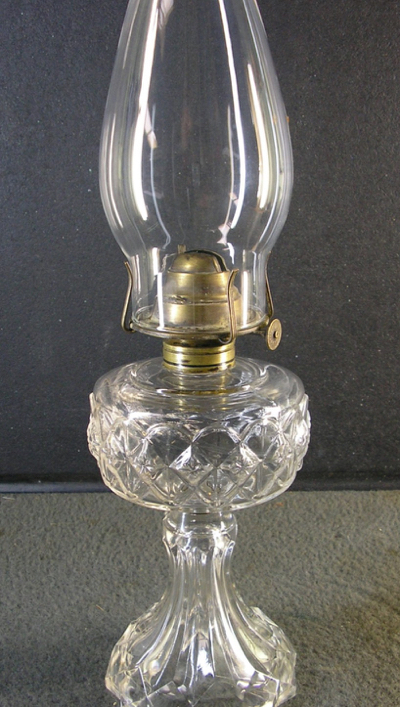 It is not uncommon to find glass oil lamps with a make-do repairs. 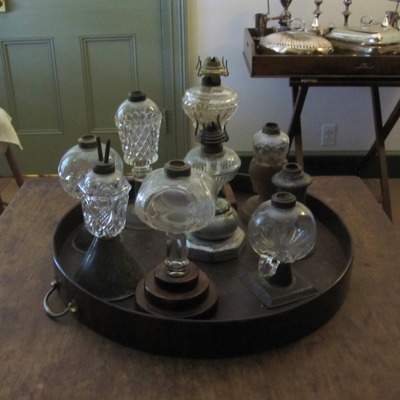 Starting in the late 1700s, most homes had at least one glass oil lamp and due to their daily use and frequent handling, many became damaged. 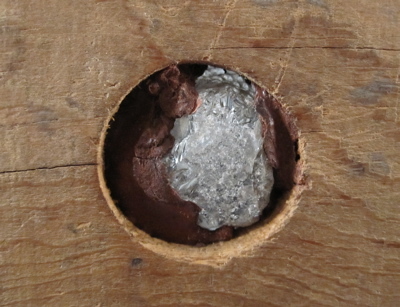 On this example, a brass ferrule joins the surviving glass bowl to a carved wood replacement base, which appears to be an at home repair. 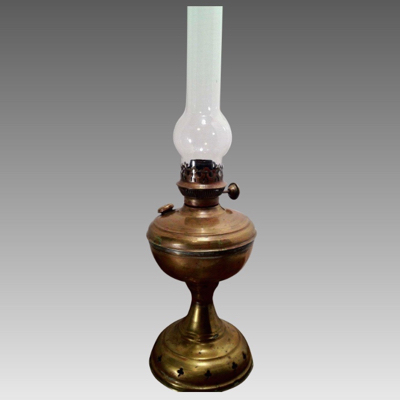 The burner is a modern replacement and allows the lamp to function as it originally did over 130 years ago. 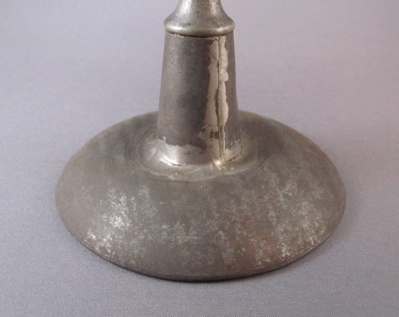 This lamp with similar form suggest what the original base on my lamp might have looked like before it took a tumble. 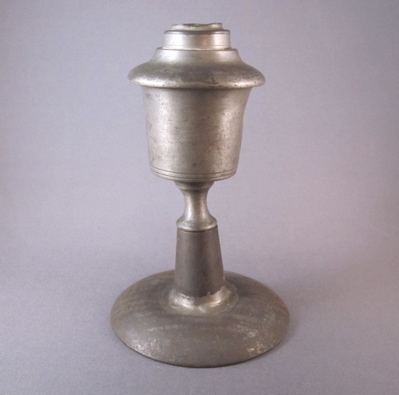 This early American pewter whale oil lamp with squared off acorn shaped font stands a tad more than 6″ tall. 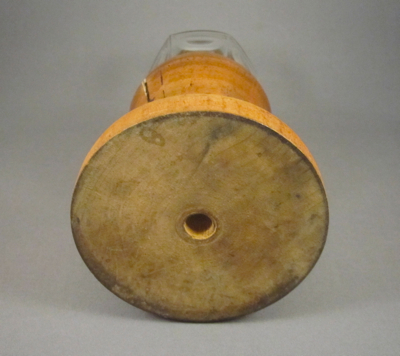 Whale oil was the preferred source of lighting in the early 1800s, and was also used for making soap, textiles, jute, varnish, explosives and paint. 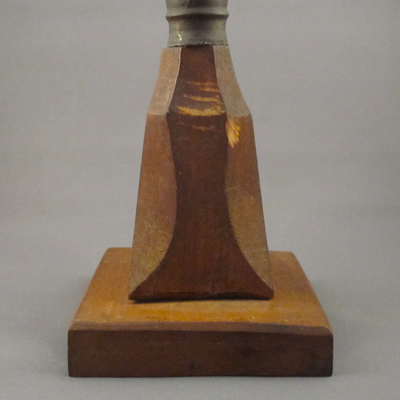 It fell out of favor by late 1800s as a result of the development of kerosene oil in 1846. 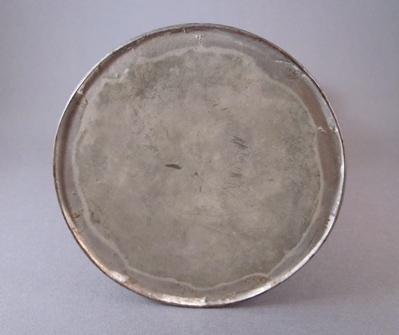 The metal replacement base, made by a tinker in the 19th century, has oxidized to almost the same tone as the pewter, thereby making the repair hard to detect. 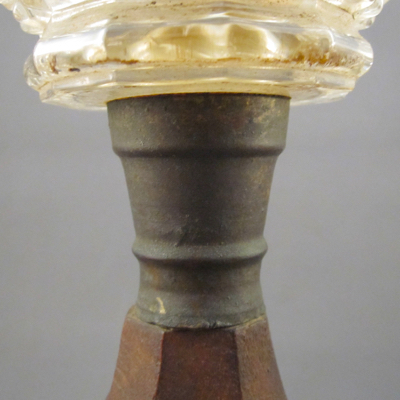 As a result of the missing double burner atop, this lamp instantly transforms into a unique and quirky vase. 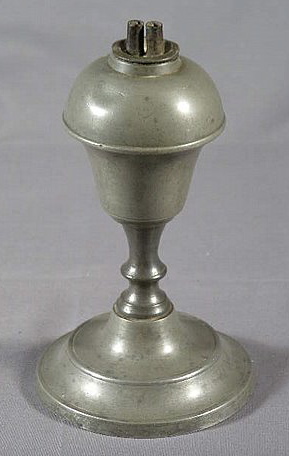 This example still has its original pewter base and double burner. 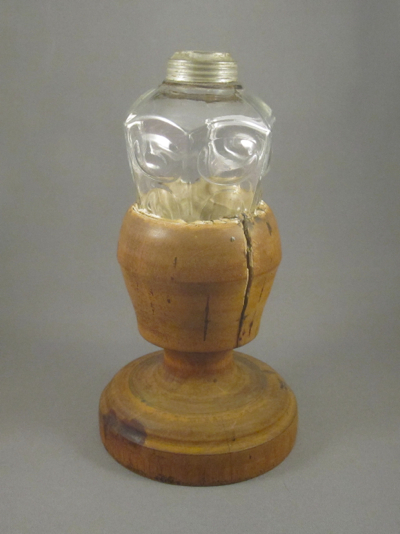 This whale oil lamp is pulling a Jonah in reverse, as it appears that the “whale” has been swallowed up by its wood replacement base. 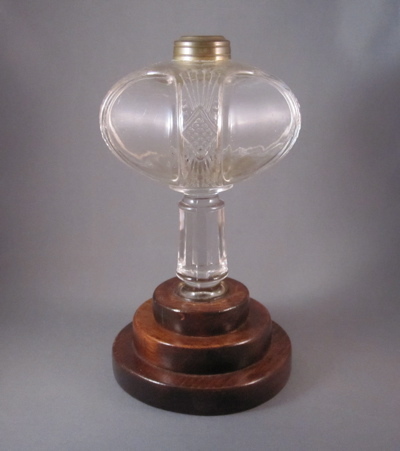 Possibly made by the New England Glass Company in Cambridge, Massachusetts, in the mid-1800s, this tri-mold pressed glass lamp with thumbprint pattern stands 7-1/4″ tall. 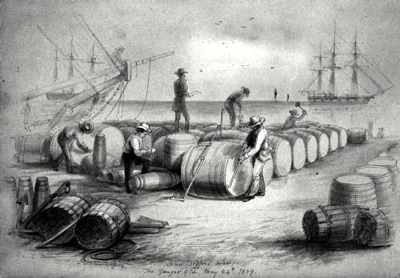 Whale oil was the preferred source of lighting in the early 1800s, and was also used for making soap, textiles, jute, varnish, explosives and paint. 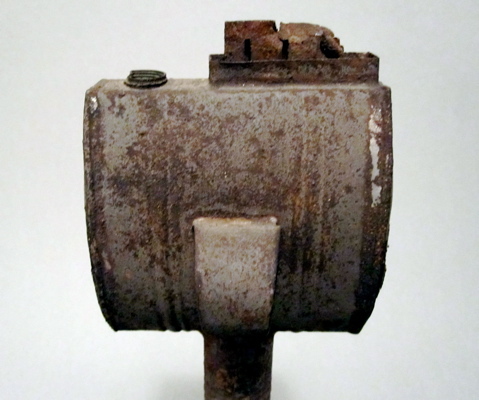 It fell out of favor by the third quarter of the 1800s as a result of the development of kerosene oil in 1846, a cheaper and less odorous alternative. 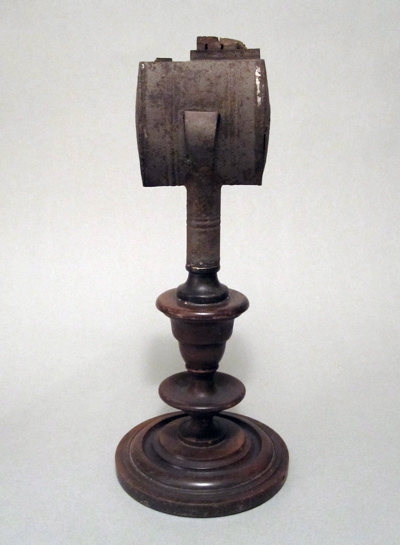 The lathe-turned wood base envelopes more than half of the lamp, which results in a whimsical, yet sturdy, home repair. 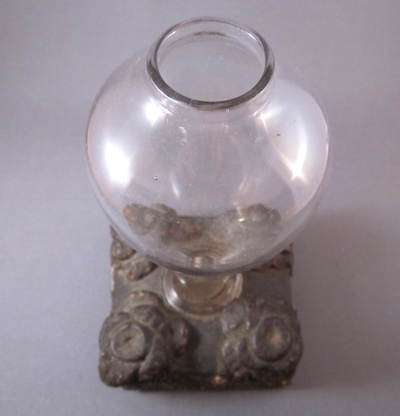 This oil lamp with similar form shows what the original glass base on my lamp most likely looked like before it took a tumble. 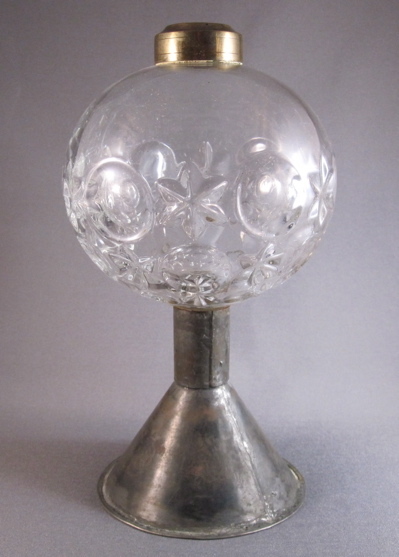 Early American Pattern Glass (EAPG) kerosene oil lamp in what appears to be the Hamilton (aka Cape Cod) pattern, made in America by the Cape Cod Glass Company circa 1860. 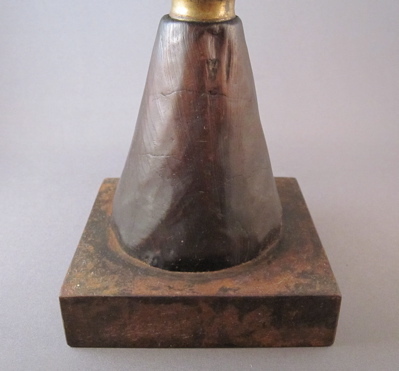 Measures 8-3/4″ tall. 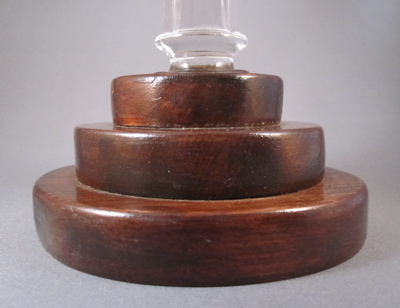 Round 3 tier base of polished wood replaces the original glass base, broken many years ago and replaced in first quarter of the 20th century. 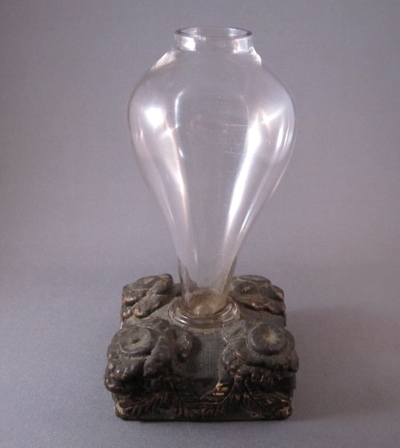 This simple, hand blown glass whale oil lamp was made in America in the early 19th century. 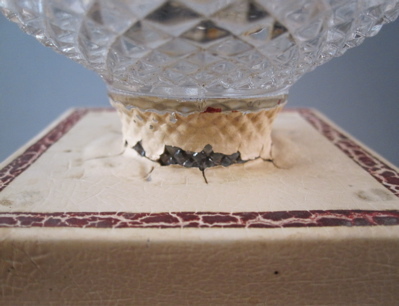 Though no longer functional as a lamp, it now makes for an interesting vase. 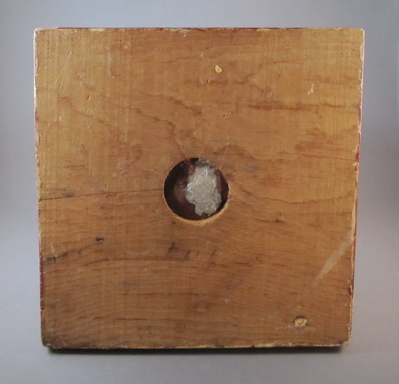 A true make-do, it started out life as one thing and as the result of an accident, was reborn as something entirely different. 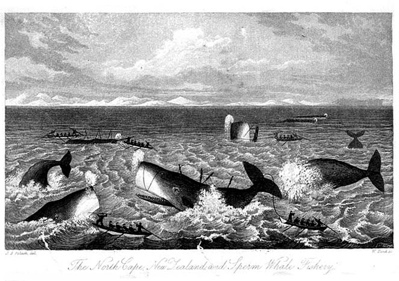 Whale oil was the preferred source of lighting in the early 1800’s, and was also used for making soap, textiles, jute, varnish, explosives and paint. 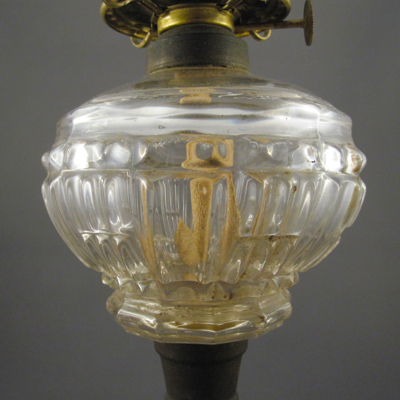 It fell out of favor in the mid-late 1800’s as a result of the development of kerosene oil in 1846. 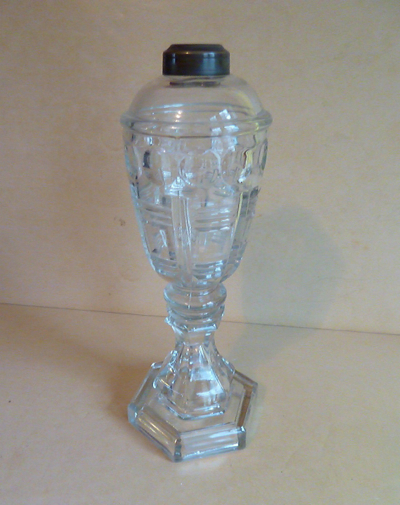 Lamp/vase measures 6-1/4″ tall and the base is 3″ square. 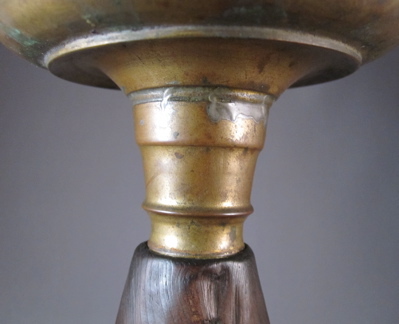 The original brass collar and burner went missing long ago. 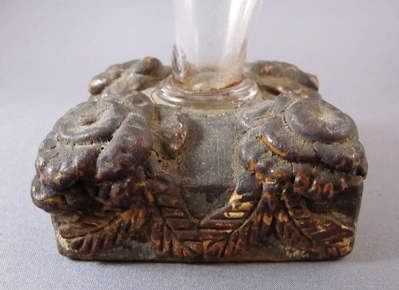 It is not unusual to find oil lamps with replaced bases, as they were one of the most used household items in the 19th century. 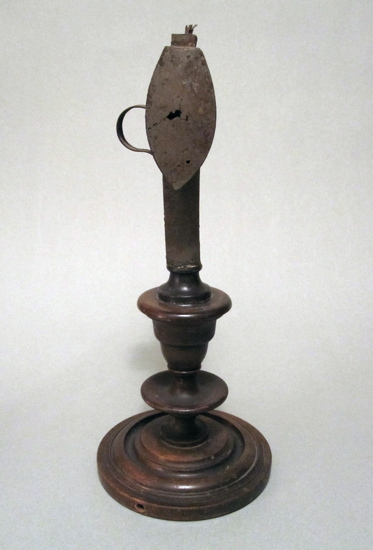 This unusually elaborate replacement base is made of wood and covered in gessoed relief flowers, with a floret at each corner. 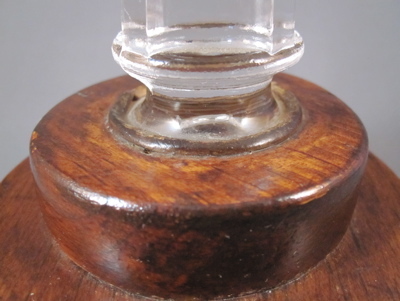 This complete lamp shows what the base on my lamp might have looked like.